According to the manufacturer of Femarin, menopausal women should have available to them natural support for their hormonal transition. 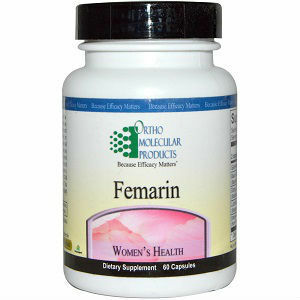 Femarin has been formulated with that intention, and is marketed as a well balanced natural formula to provide relief during a woman’s menopausal transition. As usual, we decided to conduct some extensive research and decide for ourselves if Femarin can live up to its name. Gamma Oryzanol– Gamma Oryzanol has insufficient evidence showing that it can help with menopause and aging. Black Cohosh– Black Cohosh has been shown in some studies to reduce the symptoms of menopause. Dong Quai- This can help with relieving some menopausal symptoms. Licorice- Licorice can help reduce symptoms of Chronic fatigue syndrome. The recommended dosage for Femarin is 2 capsules each day. The price of one bottle of Femarin is $35.90, however there was no indication as to how many capsules were provided with one bottle. With a recommended dosage of 2 capsules daily, there would need to be at least 60 capsules in a bottle to last a month. Femarin comes with no guarantee, and we looked hard for one. Femarin is just another one of those supplements that throws in ingredients without doing any study first. The ingredients used in Femarin are not proven to be effective or even beneficent for menopausal women. There is no guarantee, nor any reference as to how many capsules are provided with a bottle. Jackie Horowitz	reviewed Ortho Molecular Products Femarin	on September 5th	 and gave it a rating of 2.